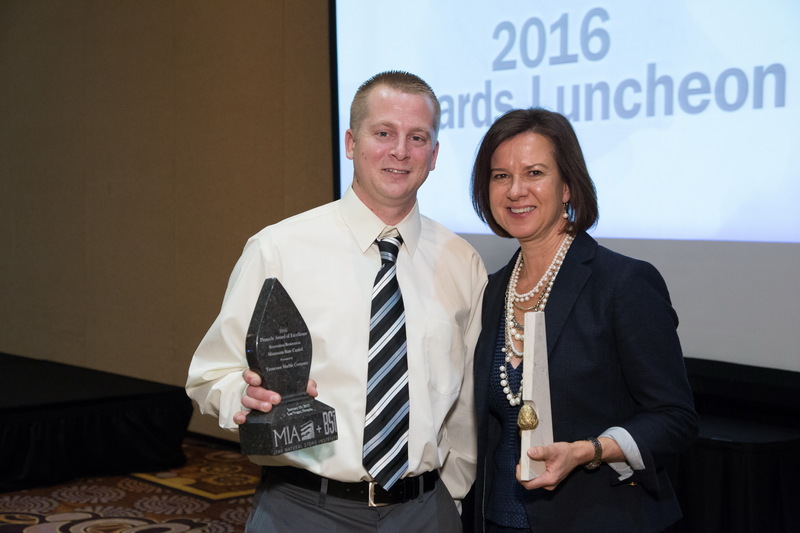 Tennessee Marble Company was honored to receive an MIA Excellence Award and The Grand Pinnacle award for its role as a fabricator for the MN State Capitol project. Five companies involved in the project were recognized for their outstanding contribution to the restoration project. The project, supplied by Polycor Inc. required nearly 4000 pieces of Georgia White marble for replacement on the exterior of the building. As one of three fabricators, TMC cut, fabricated and shaped unique pieces in varying sizes, thickness and molds using CNC technology as well as hand carving techniques to achieve a blend of old and new pieces throughout the sprawling facade. “This project was like no other exterior stone restoration project in our 24 year history, due to the volume of matching stone required, and the extent of the custom shaping performed on the stones,” said President, Monica Gawet.